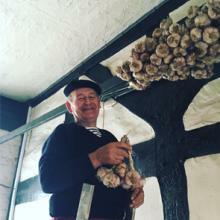 It is a very special occasion in my gastronomic year when François Seité, one of the last of the Onion Johnnies from Brittany, and his charming wife arrive with strings of the new season Roscoff garlic that is in a league of its own. 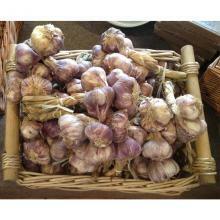 He also brings the strings of glorious Roscoff Rosé Onions. What is special about these onions is that they are natural, growing on remarkably fertile seaweed-fed soil which gives them a pink tinge and a sweet taste. French onion farmers started making the journey across the Channel to sell their wares in Plymouth in 1828, when Brittany experienced a bumper onion crop. Many wore traditional striped tops, berets and were called Jean, which gave rise to the "Johnny" nickname. By the 1930s, more than 1,500 were in Britain. Now, however, with only about 15 remaining their future is unfortunately uncertain and it will be a great loss if the tradition ends.